What depletes you? Besides your own fears and procrastination, what else tries to prevent your manuscript from coming into being? I’d like to argue that it’s miserable people. I sometimes encounter those who hate others being happy. These people who feel inadequate or insecure look for ways to destroy those who are creative producers. Let’s call them destructors. 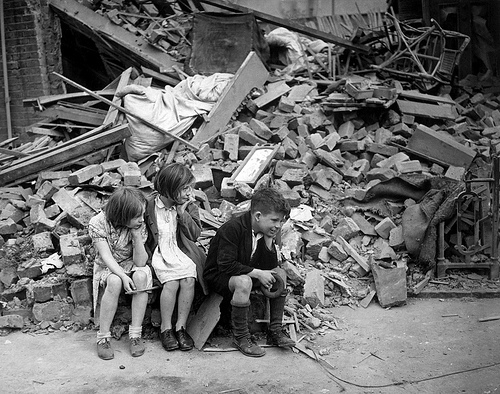 Graham Greene’s short story, “The Destructors,” stars an unhappy boy named Trevor whose family has fallen on hard times in post-war London, a city blasted by German bombs. He’s a boy with intellect and leadership skill that he twists to a dark purpose: the destruction of architecture. He corrals a bunch of boys to follow him and for a while, he’s successful in his mission. Greene wrote about a boy mangled by traumas never shown us directly, but most likely add up to some form of abuse and neglect. A boy like Trevor, gifted with precocious verbal skills and the ability to inspire others, may well spend his life blasting his PTSD on a crowd. He cannot contain his thoughts or actions to a narrow convent room and Wordsworth-like, make angry art simmering on the page. He is more Byron–but with a death wish for others–who must be seen and heard while he drags everyone down. People like Trevor who take joy in the wreckage left in their wake have destruction as their norm. They watched a mother, father, brother, or sister lay waste to others before they learned to speak. So hatefulness and spite, withheld love and stingy living, a hard fist or a smacked mouth, that is the everyday and not the exception. We must remember this when we write about them. People like Trevor cannot create because their soul is stained by lack. Bitterness stops their creativity and fear stays their hand. The same hammer you or I would use to build is only good in theirs for ruin. We must remember this when we write about them. People like Trevor with deeply low self-esteem hate themselves. What they project on you is that self-hatred. We must remember this when we write about them. The house the boys attack belongs to a man they call Old Misery. Graham Greene’s genius–so creatively simple, so directly brilliant–sets up a tableaux of our daily human drama. People seek to hammer you down, rip out your wiring, knock down your load-bearing walls. The child of this might well be your misery and theirs–though theirs is mixed with a dark pleasure. But unlike Old Misery, I won’t get locked up while boys jeer outside. I won’t cry out with pleading or moaning. My house will not be mangled. Anyone who keeps writing knows this. The act of putting words to paper is rebellion–procreative, gestational, resurrecting. It’s a raging against the dying others would perpetrate. No, I didn’t receive a cry-tique from anyone lately. I am blessed to work with fellow writers whose eyes see clearly to my page, who make comments from a place of caring. They want my work to get better. Nope: I was simply going about my daily business apart from this writing life when let’s just say, my car got clipped. Now there’s a long rake in the paint on the passenger side. The sideview mirror, nicked and dented, needs to be righted. But no matter: the rogue car is in the rearview, and I don’t put stock in stuff anyway. A car’s just a shell to get me somewhere, much like my ego, status and all other outer trappings. The spirit that rides within, she is what matters. She’s got somewhere to go, and she won’t be stopped. Who is trying to stop you? Will you let them? Write in spite of hate and blockage. Write 50 words of rebellion. Write a letter to your would-be destructor. What part of your car can you leave behind? Read Graham Greene’s “The Destructors.” Construct a story, poem, or essay about a ruined place or a rebirth.